Attention Deficit Hyperactivity Disorder (ADHD) is a cognitive disorder typified by an inability to control emotions and behavior, with or without accompanying hyperactivity (inability to maintain focus and attention). This inability to maintain focus and attention, combined with excessive fidgeting, increases feelings of stress and anxiety, and an inability to follow directions. Although ADHD is certainly more common in children, it has also been known to continue well into adulthood in some more susceptible individuals. ADHD is quite prevalent in today’s society, with approximately 11 percent of children between the ages of 4 and 17 years thought to have been diagnosed with the disease . Traditional treatment typically involves somewhat heavy medications containing either stimulants or anti-depressants, often combined with counseling. Interestingly, there has also been recent evidence to suggest that certain supplements may also play an important role in the management of ADHD – ideally reducing the reliance on heavy medications. Wondering how much ACV you should drink? Here's the answer! How do ADHD supplements work? ADHD is somewhat unique in that its cause remains relatively unknown. As a result, many of the medications prescribed merely treat the symptoms of the illness, rather than its root cause. With this in mind, supplements attempt to somewhat bridge this gap, by treating some of the issues within the body that may be leading to ADHD. This is done by improving the health of the cells found within the brain and the nervous system. In doing so, they can improve the ability these same cells function on a daily basis, improving focus, mood, attentiveness, and limiting cognitive issues. Additionally, those individuals suffering from ADHD (and other cognitive disorders for that matter) have been shown to demonstrate deficiencies in nutrients important to normal emotional and cognitive function. By returning the levels of these nutrients found within the body back to normal, we may see improvement in ADHD. 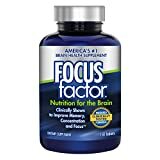 What should I look for in an ADHD supplement? The high prevalence of ADHD in American children has led to a huge amount research being undertaken in the area of ADHD supplements as means to lessen the impact placed on both the healthcare and education systems. Zinc: is an essential nutrient that plays an important role in various functions within the body, including maintaining optimal brain cell function. Low zinc levels have shown strong associations with an increased incidence of ADHD, suggesting that its supplementation may reduce the need for heavy ADHD medications . Omega 3 Fatty Acids: are one of the most important compounds known to man when it comes to the development of brain and neural tissue. Key Omega 3 fatty acids are also used to build the membranes of nerve cells, improving their ability to transfer messages around the brain. This suggests that Omega 3 Fatty Acid supplementation may have the ability to improve neural function and emotional control . Iron: is a common mineral that plays an incredibly important role in brain development, while also facilitating the production of important neurotransmitter within the brain. Interestingly, a vast number of those individuals suffering from ADHD also exhibit low iron levels. As such, the supplementation of Iron has been suggested to cause vast improvement in ADHD symptoms . Magnesium: is an important mineral that has been shown to play a key role in normal brain function. Magnesium deficiencies have been shown to result in declines in mood, emotional state, and attention – all of which is apparent in those suffering ADHD. As a result, the supplementation of magnesium has shown to result in improved function in those individuals suffering from ADHD . As you can imagine, there is a rather large number of ADHD supplements appearing on the market. As such, we have gone through and found what we believe to be the top ADHD supplements available at the moment. Including all the essential minerals required to maximize brain function, this is one of the most commonly recommended ADHD supplements on the market – and for very good reason too. Using high quality ingredients in scientifically supported dosages, this is a great option. Its only real negative is that it doesn’t include any omega 3 fatty acids within its formula. As such, we would recommend you also take a high quality fish oil supplement to go with it. Focus factors brain health supplement is the most complete option on this list. Not only does it contain all the essential minerals mentioned above, but it also provides the body with a healthy dose of DHD – the most important omega 3 fatty acid for brain health and neural function. Taking this into consideration, it offers an excellent option for those suffering ADHD looking to reduce their reliance on more traditional medications. 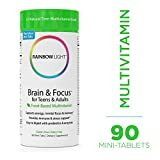 Rainbow light are a bit an up and coming supplement company that are building a solid reputation for producing good quality supplements at a fairly reasonable price point. With this in mind, their brain and focus supplement offers us with a great option at an excellent price. Similar to the F & Q supplement above, this does not include omega 3s within its formula, as such we recommend you take them additionally. ADHD is common disease that is only increasing in prevalence. While many individuals are treated with heavy medications and counseling, many would argue there is more we can do – which is exactly where ADHD supplements come into the equation. These supplements offer an opportunity to resolve some of the issues thought to contribute to the onset and severity of ADHD, allowing us to reduce our reliance on more traditional means of treatment. If you have had any experience with the supplements listed within this article, we would love to hear about it – so please drop us a comment and we will get back to you ASAP.